Just off of Lougheed Highway on Brighton Avenue in a quiet Burnaby neighbourhood, 100 meters of sidewalk narrowly pinned between two fences connects pedestrians with the nearby public transit hub. The fences along the path, given their proximity to the SkyTrain and local high school, have seen their share of graffiti and vandalism. In the past eight months, however, a striking new mural has appeared amidst the usual tags. Painted in a rough, primal style and rife with imagery from the Ukrainian conflict, the mural reflects an entirely different mode of wall-writing than the neighbouring graffiti. Without any artist attribution or attempt at context, the work appears as a haunting artifact of a distant war. Nestled amongst the other graffiti, this mural is destined to be ignored by many and cast off as pure vandalism. Yet its placement in the coded and ephemeral sphere of other graffiti allows the work to infiltrate a familiar landscape and reach an audience from an unexpected and unique perspective. The mural spans seven panels of fencing, divided into four tableaus. Within the panels, text, symbols, and figures are painted in a crude, primitive style. The focal point of the mural is two centre tableaus spread across four panels. These two images form a sort of diptych which anchors the whole mural. The first tableau features a large figure in an ambiguous European Imperial military uniform. The figure is flanked by two contorted versions of the Soviet hammer and sickle. Behind the figure, a large red floating face reminiscent of a cartoon devil grins. In his hand, the figure aims a gun at a crowd of crudely drawn skeletal figures with their hands up in submission. The second tableau contains Russian text which translates to “Never forgive, never forget” underlined with a row of flames. Unknown. Untitled Mural, Detail, 2014. Acrylic on wood. Photograph by Joe Tucker. What is immediately striking about these central four panels is the violence with which the figures are depicted. The armed figure’s face is drawn with manic lines of red and yellow, its eyes circled repeatedly giving a crazed look. Within the figure, different paints are used, and in some places the bare wood is left to show through. The result is a sense of chaos within the figure’s frame. This chaos is directed from the bright red face of the devil behind the figure, down the figure’s arm and through its gun. Thick and jarring brush strokes are used to construct the submissive figures, who appear as white skeletons painted on black shadows. Their bodies are inconsistent, stick figures reminiscent of cave paintings or a child’s drawings. 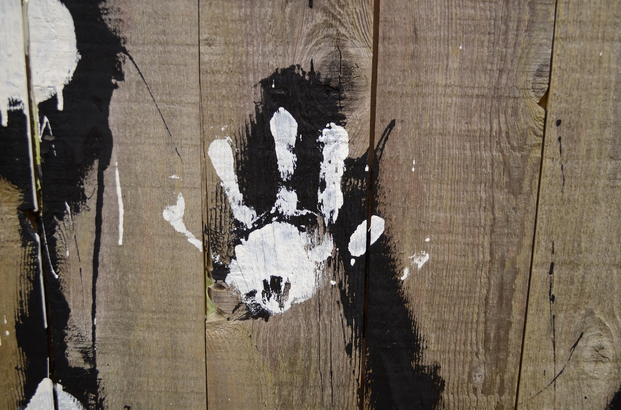 One figure who appears to be a child is given a face with a handprint, a remarkably striking and tactile technique. These images invoke the sketches by children who have experienced trauma, the barest representations of power, violence, and death scrawled with untrained hands. Unknown. Untitled Mural, 2014. Acrylic on wood. Photograph by Joe Tucker. Tucked away in a pleasant Canadian neighbourhood, the imagery and language used in the mural call up an entirely different context. The names of Russian leaders, Soviet symbols, and Russian text call up the conflict in Ukraine. The colours of the medals on the Imperial figure’s jacket are the colours of the Ukrainian flag. Even a slogan painted in cyrillic above a line of fire, which translates “Never forgive, never forget”, is in fact a chant that has been used by Russian supporters in Ukraine. The mural is something we would expect to see in news reports from Donetsk or Luhansk, scrawled on the ruins of a shelled building, a reminder for the Russian loyalists and a warning for supporters of Kiev. Instead, it appears without warning in an unremarkable pathway in Canada. One wonders what inspired the artist to paint such a political piece outside of its direct context. Perhaps it was a Russian supporter living in Canada who sought to get their message out to the public, or a copycat artist mimicking graffiti emerging from the Ukrainian conflict out of admiration. Regardless of intent, it is the shocking location of this imagery that makes this mural noteworthy. Graffiti operates with a coded language of names and styles. The tags and pieces are put up by artists for others within the graffiti fold to recognize and respond to. Someone outside of this circle may only see a graffiti work as an act of vandalism or meaningless self promotion. In areas such as Brighton Avenue, graffiti is such a constant that it is largely ignored by those who aren’t participants. For the mural at hand, this setting proves to be the most effective mechanism of the work. To its audience, the mural appears to be part of the native graffiti landscape. An initial glance over the tableaus on the fence reads as if the events being retold are happening in the same neighborhood, as if the terror of the Imperial figure is present in Burnaby. The viewer receives an experience that would normally remain inaccessible to them: that of the citizen whose neighbourhood is transformed into a warzone. Though brief, this experience is organic. There is no information to prompt a reading of this mural as foreign, and thus an immediate shock is felt, as if some massacre happened in the shadows of the surrounding area and this is its only record. This experience is probably the most striking and memorable aspect of the mural. It is not a work that allows for a very detailed reading, the imagery is blunt in its portrayal of violence and its location prevents most viewers from stopping to take a careful look. As with most graffiti, this mural will most likely be removed or covered up within the next few months. Already, someone has defaced the mural with a series of “CANADA 5-4” markings on each panel, a reference to Canada’s victory over Russia in the recent World Junior Hockey tournament. This comedic and trivializing addition to the mural buries it further amidst the graffiti noise in the area. Arguably, the work is wasted in such a hidden spot. Perhaps only a handful of people will have acknowledged the mural as more than just graffiti. As it fades away, the mural will leave behind a small legacy amongst those who have paid it attention. A photo collage of the entire mural is available online.